A pure DSD recording from Sonoma Records. Produced by 12-time Grammy award winner Steven Epstein and engineered by Richard King, Music for Organ, Brass and Timpani was recorded and post-produced entirely in the DSD domain on a Sonoma Workstation. Customer Reviews (3.67 Stars) 15 person(s) rated this product. Best SACD I have heard! To be fair, you will really need a good subwoofer to hear the full impact of this recording. The brass ensemble's playing is crisp and professional. Sonics in the church are just OK...there is a wide space between left and right channel groupings. On some tracks when I listened, I felt I was right in the church listening.. Bass is not the absoulute lowest ( For that try Mary Preston's new Organ recording on Reference Recordings.) This is a Fantastic recording....Crank it up with the lights off...lYou are there! I'm a trumpeter with hundreds of brass recordings and this ranks in the top two or three of my collection. The arrangements are wonderful and the performances are all first rate. These types of recordings usually fail to balance the brass with the organ effectively, but in this case the balance is perfect. 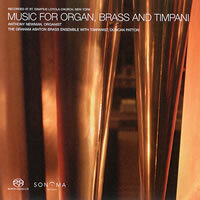 The burr and burnish of the brass is captured as are the wide variety of sounds from the various organ stops. Timpani is just right. One reviewer thought this was lifeless, my advice is to TURN IT UP. If you've ever listened live, it's meant to be loud. I'm now looking for more SACDs produced by Sonoma. Although, I'm just starting out with SACDs, this one sounded rather plain to me. I do not feel like listening to it over and over again. There are better quality recordings out there, IMHO. This is one disc you MUST have! Even if you don't have SACD capability you will find this to be an outstanding presentation. With the SACD sound you are carried into the recording area and surrounded with music beyond reproach. The finest recording and performance I have ever heard! Simply magnificent! What more can I say? The presence of the organ is phenominal in the lower registers. Subtle but definite. I don't understand the rave reviews for this title. I purchased it with high expectations, but found both the stereo and multi-channel to be rather lifeless. I have tried multiple times to listen to this to see if I just hadn't connected with it yet, but to no avail. With such high hopes from a recent review in multichannel, the CD layer in stereo was very disappointing. The soundstage was small and not well defined. The bottom end was lacking to the point of being absent. Sonoma should pay closer attention to the CD layer, much like Fidelio and others do in their fabulous hybrid SACDs. Where is the air?? The space??? This is an interesting disc. The playing is top notch, but there is not as much air and space as the venue would seem to offer. Maybe the players should have been placed with wider spacing to accommodate some much needed sense of air and space???? Recommended, but only as a two channel!!! Well played and well recorded, thought the tempos are a little plodding. The Great Gates Of Kiev could have used a little "con brio", maybe an appropriate cymbal clash? Overall, a "you are there" experience!